I’ll start with the Facebook post itself. As of writing (16 hours after original posting), it has been shard 1,842 times, liked by 6,494 people and has 218 comments. These numbers are actually relatively low for an IFLS post, some of which can reach over 70,000 shares! Let’s now have a look at what it did for the Andromeda Project. The project, which was launched two days previous and was already pretty popular, had settled down to around 100 active users per hour. This number shot up to almost 600 immediately following the post. In the space of 5 minutes the number of visitors on the site went from 13 to 1,300! After a few hours it settled down again, but now the steady rate looks to be about 25% higher than before. The number of classifications per hour follows the same pattern. The amazing figure here is that almost 100,000 classifications were made in the 4 hours following the post. This number corresponds to around 1/6th of the total needed to complete the project! 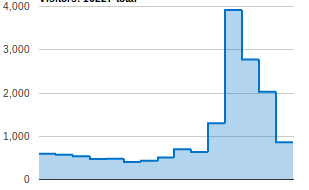 The number of visitors per day to the Planet Hunters site over the last two weeks. Visits increased by a factor of ten on the day of the IFLS post, and three days later the numbers are still greater than before. Two days after her post about the Andromeda Project, Elise put up a post about the discovery of a seventh planet around the dwarf star KIC 11442793, which was found by citizen scientist on the Planet Hunters project. This post proved even more popular than the previous one with more than 3,000 shares, and led to a similar spike of the same magnitude in the number of visitors to the site (as can be seen in the plot above). Finally, what did it do for the Zooniverse as a whole? Well there have been over 4,000 new Zooniverse accounts registered within the last four days and the Facebook page, which was linked in the AP article, got a healthy boost of around 1,000 new likes. So all things considered, it seems that an IFLS post can be very useful for promoting your project indeed! Thanks Elise, the Andromeda Project, Planet Hunters and Zooniverse teams love you! The Zooniverse loves all the wonderful things you do when you’re on our website, but we know that sometimes (but just sometimes) you stray and visit other URLs. We’re hoping that maybe, when you’re not hanging out with us here in the Zoo, you can take us with you to some of the places where you go to socialize. We’re all about the science, but after hours we know how to hang out and have a good time too. As you can see right here on the blog, we have twitter feeds. They’ve been around a while, and a bunch of you are already following us. For those of you who may not have kept up with all the feeds, here are all our feeds: @The_Zooniverse, @GalaxyZoo, @GalaxyZooMerger, @Supernovae_Zoo, @SolarStormWatch, @MoonZoo, and @HannysVoorwerp (for the upcoming webcomic). What’s new is our brave new foray into the land of Facebook. We invite you to make friends with “Explore Facebook”. Along with this “Person,” we’ve also created a whole series of fan pages. 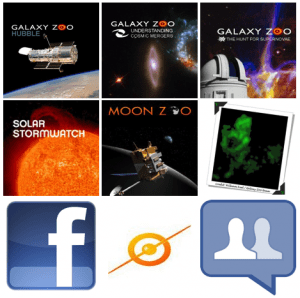 You can now be a fan of: Galaxy Zoo: Hubble Edition, Galaxy Zoo: Mergers, Supernovae Zoo, Moon Zoo, and Webcomic: Hanny’s Voorwerp. Each fan page will let you keep up with the twitter feeds, blog posts, and we’ll even periodically be announcing special, in Facebook, opportunities. We also have a favor: Several of you have created your own Galaxy Zoo fan pages and groups in Facebook. We’re trying to get everything tied together. If you own one of these pages, could you please message us through Facebook? We just want to make sure all the fan page owners know about some cool new things that are coming, so we can get the word out together.